After four years of waiting for UNHCR to grant Mohammad Ghamari Tabasi an interview, Tabasi and most of the other members of the families camped out across the street from UNHCR offices in Erbil have been granted a first interview, along with several other appropriate accommodations. While the International Coalition for the Rights of Iranian Refugees acknowledges UNHCR for their efforts in these cases, it has also become necessary to highlight the highly unprofessional behavior of UNHCR staff during the interviews that have ultimately been granted. We expect UNHCR to take steps to investigate and ameliorate its staff behavior. We also look forward to fast-track processing of these cases, particularly Tabasi’s, and we expect the additional member of the camp, Zolfaghari, who is very ill, to also be granted his first interview. Mohammad Ghamari Tabasi is a known former political prisoner from Iran. After his release, he fled Iran for Iraqi Kurdistan in 2007 with full documentation in hand about his imprisonment in Evin, and with numerous letters of support from various political and human rights organizations testifying to his extensive political activities against the criminal Islamic Republic regime, and thus his legitimate fears of further persecution. After four years of waiting for refugee status in Iraq, as of December 17, 2010, UNHCR still had not granted even a first interview for Tabasi and his family, wife Farhat and son Sena – despite Tabasi’s clear-cut case for asylum, and despite the fact that they, along with two other other refugees families, had resorted to living in a camp outside of UNHCR headquarters in a desperate attempt to get their first interview and begin the process of obtaining refugee status. On December 17, the International Coalition for the Rights of Iranian Refugees (ICRIR) published Tabasi’s story of UNHCR’s shameful neglect of Tabasi and the others in the camp, and raised the obvious question: if the rights of a fully-documented former political prisoner at clear risk of persecution by the Islamic Republic of Iran could be ignored by UNHCR for four years, what is happening to other asylum-seekers fleeing the regime with equally legitimate fears of persecution, but lacking such extensive documentation? In a possibly retaliatory move, on December 19, 2010, a UNHCR staffperson informed Tabasi that his family’s asylum-seekers’ certificate, which was to expire on December 21, would not be renewed by the Erbil office, as it has been for each of the past 4 years. Instead, the UNHCR staffperson said that UNHCR was requiring Tabasi and his family to make the arduous journey to Sulaymaniyah to renew their documents. ICRIR immediately wrote a press release to inform the media and the public of the blatant attempt by UNHCR staff to force Tabasi to move his family away from their tents located across the street from the UNHCR office, but before it was published, we learned that Tabasi had received a different communication from a different staffperson at UNHCR-Erbil. On December 20, 2010, a cursorily-written email was sent to Tabasi from the UNHCR-Erbil staffperson asking Tabasi what he wanted, and how the staffperson could help. In the email, the staffperson referred to a list of several links to video clips that Tabasi had managed to upload to Youtube showing the terrible living conditions facing Tabasi and the others – clips that stated in the title, in English, that Tabasi and the others want UNHCR to review their cases. ICRIR helped Tabasi to formulate his response to this UNHCR’s inquiry, which he sent to the UNHCR staffperson on the evening of December 20, 2010. On December 21st, he received a response by email from the UNHCR, advising Tabasi to approach the UNHCR Erbil office and speak to one of the UNHCR protection staff who are present there every Wednesday. 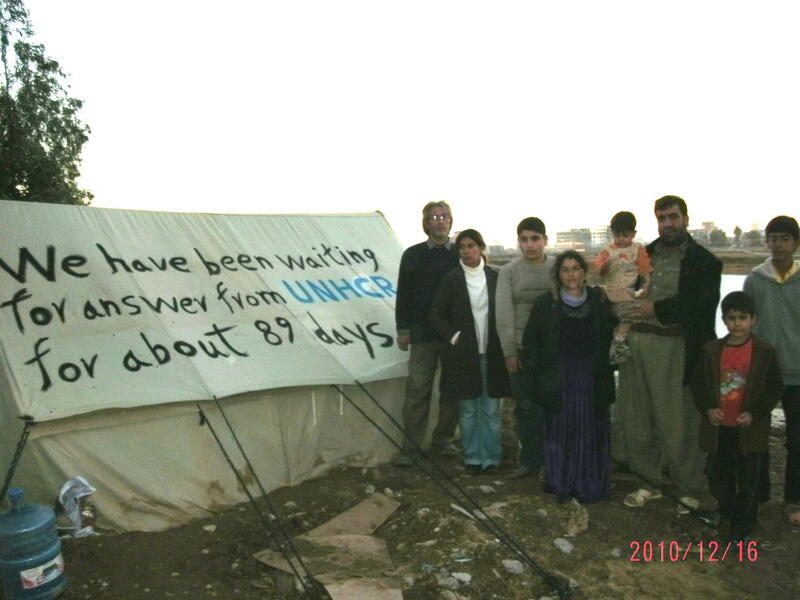 On Wednesday, December 22, 2010, just as police had arrived to remove the asylum-seekers’ camp, and on the same day that UNHCR issued a letter (in English) formally documenting UNHCR’s position that Tabasi & the Alipanah family (the other family living at the camp) would be required to go to Sulaymaniyah to renew their documents, Tabasi was called into UNHCR’s offices to discuss his situation. He came out 10 minutes later with apparently good news: UNHCR promised to solve the asylum seekers’ problems. The heavily pregnant woman living in the camp- the wife of Alipanah and the mother of three boys – was in her interview with UNHCR. The families were told they would not need to go to Sulaymaniyah to renew their documents – they would be renewed in Erbil. The women and children were given 24-7 access to the water and toilet facilities of the UNHCR offices. All of the asylum-seekers would be interviewed. Tabasi and his family, after waiting in desperation for 4 years, finally would have their interviews. — Rather than being asked about her asylum case, the pregnant woman was pressured to talk about her husband’s (Alipanah’s) behavior towards her: whether she had been abused by her husband, and whether her husband was forcing her to be there as a refugee. These questions are wholly inappropriate for an interview in which an asylum-seeker is establishing his or her case for asylum. — Alipanah was asked if he had ever carried a rifle, if he knows how to shoot a rifle, and if he belongs to any militant Kurdish groups. — Tabasi was asked for his contacts with outside media and with Israeli media. He was asked how he was able to use the internet to send emails to the outside world, and how he paid for his internet service. He was also asked about his contacts in Iran and how they helped him escape. As he is a convert to Christianity, UNHCR staff made him run out to his tent and bring his Bible to show the book to them in an effort to prove his religiosity, although his fully-documented case is primarily one of a political refugee, and not a religious asylum-seeker. Tabasi was harassed for wanting to go to the US or Europe by UNHCR staff, who said that Iran and Iraq are such nice, friendly places – and the Europe and the US were full of “cold” people who would treat Tabasi and his family as if they were terrorists. ICRIR has previously decried the lack of professionalism of UNHCR staff in Turkey; we now have numerous accounts of similar unprofessional, unethical, and possibly illegal behavior on the part of UNHCR staff in Iraq. Furthermore, documents sent by UNHCR staff to the Tabasi and Alipanah families contained highly inappropriate language (blaming the asylum seekers for “choosing” to live in such dire conditions); they contained incorrect facts ranging from an asylum-seeker’s name to the place where their case had been registered; and the time-sensitive documents were presented to the asylum-seekers in English – a language that they do not understand – with an apology for lack of translation with the excuse of shortage of time to properly prepare the documents. 5. Training lawyers in fundamental concepts of mental health and understanding its application in the interview process. Although UNHCR has told these families that their cases must be registered in Erbil, and this registration should have taken place on Wednesday, December 22, 2010, UNHCR staff declined to register these families when they requested the transfer of their documents to the Erbil offices. These families, plus an additional member of the camp who had been away seeking medical treatment, will present to UNHCR Erbil on Wednesday December 29. ICRIR fully expects that UNHCR staff will fill the paperwork of these asylum-seekers appropriately on Wednesday, December 29, 2010; inform the asylum-seekers of what has been done for them in a document that has been translated into Farsi so that it is understood by the asylum-seekers; interview the additional member of the camp (Zolfaghari) who had been away seeking medical care at the time that the rest of the camp residents were interviewed; and accelerate the process of acceptance and resettlement for these cases, with particular attention to the case of Tabasi and his family. UNHCR is responsible for its abuse of the Tabasi family’s fundamental rights, and we demand that UNHCR compensate for that abuse.